Heavy duty, polyethylene coated tape with an aggressive synthetic rubber pressure sensitive adhesive. Excellent for low temperature bonding. The permanently tacky adhesive adheres well to most surfaces under a wide range of conditions. Moisture resistant. Conformable and maintains a tight water seal in all weather conditions. 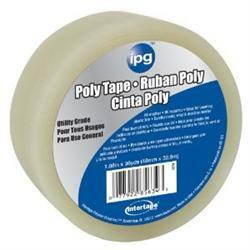 For temporary repair or splicing of polyethylene sheeting, home, office, recreational repairs, and surface protection. Wrapping and sealing, binding and bundling, and general maintenance. 2'' x 108'. 9 mil. Great for use on Bed Bug Heat Treatments!